Feng shui is an ancient art that is, as Lama Zopa Rinpoche has explained, the second best way—after Buddhism—to help people. In this course with Jampa Ludrup you will learn how to maximize your outer environment for the best outcomes in all areas of your life. Ven. Jampa takes us through three schools of feng shui: the Form School, Compass School, and Flying Star School, sharing techniques from each that will help you transform your space so that it is conducive to manifesting good luck. In this introductory lesson Jampa Ludrup shares with us important concepts as we begin our exploration into this ancient art, including how we can understand the relationship between feng shui and karma. Dive into the Form School of feng shui and learn about how landscapes, rivers, and roads can affect the energy of your home. Jampa Ludrup shares important tips regarding the Form School’s understanding of gardens, the shape of buildings, the front door, and the interior layout of the home. In this lesson we finish our journey into the Form School by learning about the interior layout of the home and feng shui tools, and hear Jampa Ludrup’s top ten feng shui tips. We begin our exploration into the Compass School of feng shui and learn how to determine our personal directions. In this lesson, we learn more about the fundamentals of the Compass School, the Ba Gua, and the cycles of the elements. In this lesson we finish our journey through the Compass School by reviewing feng shui tools and learning to apply the Lo Shu square to the building. In this lesson we recap important points from the Form and Compass schools and begin to learn about the time dimension of feng shui. Jampa Ludrup teaches us about the sitting and facing directions of a building, the stars, and how to draw flying star charts. In this final lesson, we learn about the characteristics of the stars, auspicious and inauspicious combinations, and how to apply the Flying Star charts to different buildings. This lesson will be available on Monday, May 21. Stay tuned! Ven. Jampa Ludrup started his working career as a science teacher and in 1979 moved into the information technology industry. 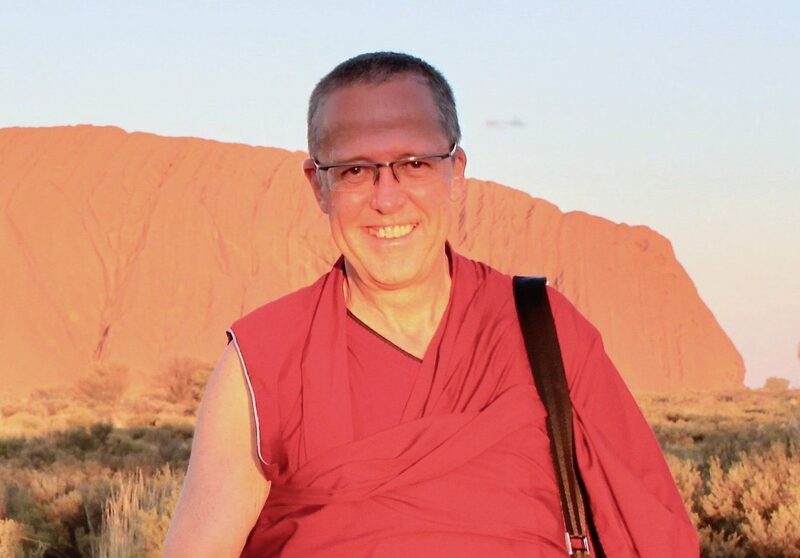 He spent fifteen years in computer education and writing before undertaking a complete change of lifestyle when he became a Buddhist monk in the Tibetan tradition. In 1996 Ven. Jampa was an attendant to Ven. Lama Zopa Rinpoche during his tour of Nepal, India, Singapore, and Malaysia. At this time Lama Zopa made his first contact with feng shui Grand Master Yap Cheng Hai and world-renowned expert and prolific author Lillian Too. With Lama Zopa’s encouragement, Ven. Jampa made a study of their system of feng shui, and after personal experiment he started to give advice and consultations. Since 1998 he has been resident at Sera Je Monastic University in South India. Since 2003 he has been much in demand, and has given feng shui courses and consultancy to many businesses, institutions, and individuals all across the globe.